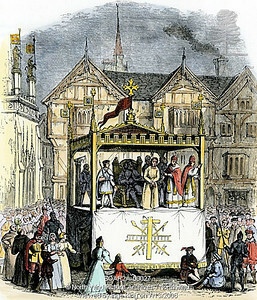 One of the factors contributing to the demise of the 16th Century English Reformation was the regional “mystery plays”: local pageant cycles in which the common folk performed dramatized Biblical stories. (The York cycle is the most famous.) Many of the surviving texts derive from the flowering of Middle English in the wake of Chaucer and Langland, and are of a very high literary quality. The performances were mounted by various guilds and professions, so the coopers would dramatize the Fall of Man, the shipwrights the building of the ark, the tile-thatchers the Nativity, the butchers the Crucifixion (yes, really), and so on. The plays were done on “pageant wagons”: essentially horse-drawn sets not unlike parade floats. It was a way for a largely illiterate population to learn their Bible stories, but it smacked too much of popery so the authorities forcibly repressed the practice. Fortunately, we live in more enlightened times. 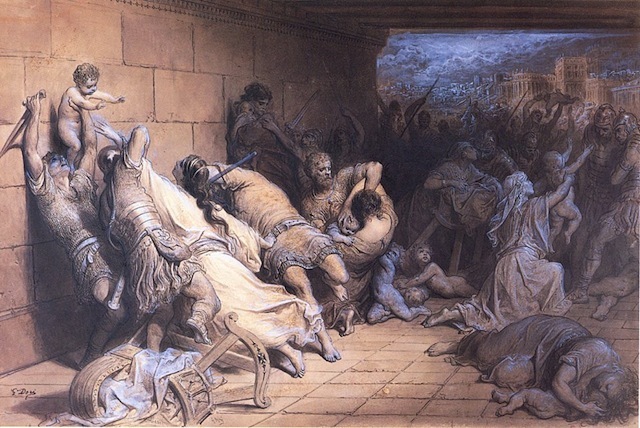 One cycle of plays was the cycle for Coventry, and the play put on by the shearmen and tailors was the slaughter of the innocents, depicting the slaughter of young boys in Bethlehem as described in the Gospel of St. Matthew 2:16-18. When Hamlet refers to an actor who “out-Herods Herod,” he’s talking about the over-emoting brought to the villainous role of Herod by amateur actors in these pageants.